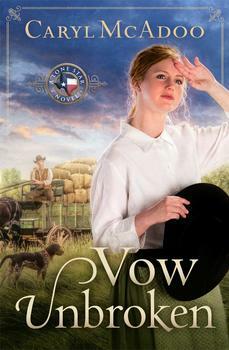 Vow Unbroken by Caryl McAdoo is a story that showed how God leads and cares for His children. I love stories about God’s provision and McAdoo’s story certainly does that. Susannah, a 19th century widow in the Texas Red River Valley, her 14 year-old nephew and 9 year-old daughter, worked hard through difficulties to get their cotton crop ready to sell. A local businessman tried to take advantage of her, offering only half what the crop was worth. The story is about her trip with a hired man, Henry, her nephew Levi and daughter Rebecca, to a port where she can sell her cotton. As might be expected, the trip was full of adventure. Henry came with a dog named Blue that definitely earned his keep. I loved the Blue parts of the story. I was impressed by Henry and despite his bad reputation; Sue and her children found him to be a wonderful man. Predictably, Sue fell in love. The problem was that she made a vow before God that she would not marry again without her father’s blessing. I felt that I really got to know this couple well because McAdoo allowed the reader to enter the minds of both Sue and Henry, giving the reader a sense of being an insider. The travel story is interesting – and it intrigued me. Sitting on a hard bench of a wagon pulled by mules could not have been easy. I also was amazed at the tasty meals that Sue was able to pull off using a campfire. She even was able to make a cake using duck eggs. The water part of the trip was a giant raft – a flatboat to New Orleans, followed by transport on steamboat to Memphis to meet Sue’s father. Vow Unbroken was a delightful story. It was exciting, funny and a love story with appealing characters. Lovers of historical romance will enjoy this book. I received this book from the publisher in exchange for a review. All opinions expressed are my own. Caryl McAdoo lives in Red River County, Texas, where she brags the nearest soda pop or gasoline is almost ten miles from home. In the country setting of the Texas piney woods, she enjoys four wheeling over the 916-acre McAdoo Ranch, horseback riding, and caring for donkeys, dairy goats, chickens, and a plethora of dogs and cats. Caryl credits her relationship with the Lord for every good blessing in her life, including ten children (counting “in-loves”) and fourteen grandsugars. Her heart’s desire is to bring Him glory.